Hyperthyroidism is a condition marked by thyroid imbalance in which the thyroid gland secretes thyroid hormones in excess. Excessive thyroxin circulates in the bloodstream and affects several body functions. Most individuals experience subtle symptoms of hyperthyroidism, such as heat intolerance, an increased heart rate and getting tired easily. Moreover, most symptoms of hyperthyroidism can be easily confused with other medical conditions making it difficult to diagnose. sudden and unexplained weight loss despite healthy eating. 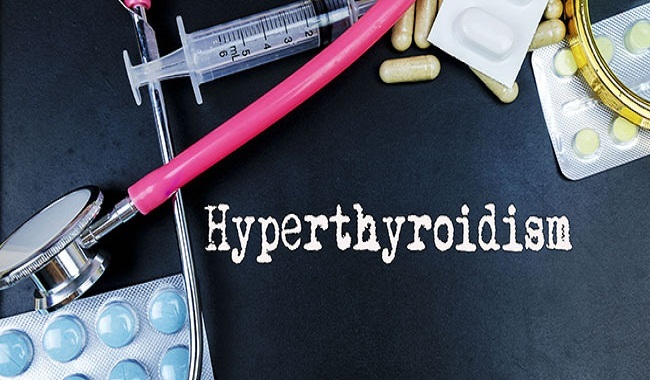 The signs of hyperthyroidism depend on how much thyroxin, the thyroid gland, is producing, how long you have had the condition and age of the course. In elderly, the prominent signs of hyperthyroidism include irregular heart rhythms and heart failure. High blood pressure, heart failure and mental changes, such as confusion are indicative of the severe form of hyperthyroidism known as thyroid storm. Graves’ disease, also referred to as Graves' ophthalmopathy, is one of the leading causes of hyperthyroidism. The disorder begins with a swelling behind the eyes, which pushes the eyeballs forward such that they bulge out of their orbits. Signs indicative of Graves’ disease include protruding eyeballs, swollen red eyes, discomfort in one or both eyes, excessive tearing, vision problems (blurry or double vision) and reduced eye movement. Hyperthyroidism is more likely to affect you if you have a family member with the same medical condition. In this case, talk to a physician and ask for tips to manage your thyroid function. Hyperactive disorder of the thyroid is more common in women than in men. See a doctor if you experience symptoms associated with hyperthyroidism, such as an unusual heartbeat, unexplained weight loss, sweating and swelling around the neck. Explain your condition to the doctor by describing the changes you are experiencing as signs of hyperthyroidism are similar to those of several other medical conditions. If you are pursuing treatment or are treated for hyperthyroidism, maintain responsive communication with your doctor so the after-effects can be addressed in an appropriate manner.